I grew up with an amazing mother who made all our bread. I think she realized that making bread rather than buying bread for a family of seven was much more affordable and delicious. My mother is actually quite famous in her small town for her delicious white bread. As a kid, I loved coming home from school and smelling that fresh baked bread aroma. My mom would always serve us up a warm slice lathered in butter – comfort food at it’s finest. I knew that I wanted to carry on the tradition of homemade bread for my family, and while I can’t say I’ve never bought a loaf or two of bread from the store, the majority of the bread we eat comes for my kitchen. While I do make my mom’s white bread often, I try to keep my family on the whole grain variety. 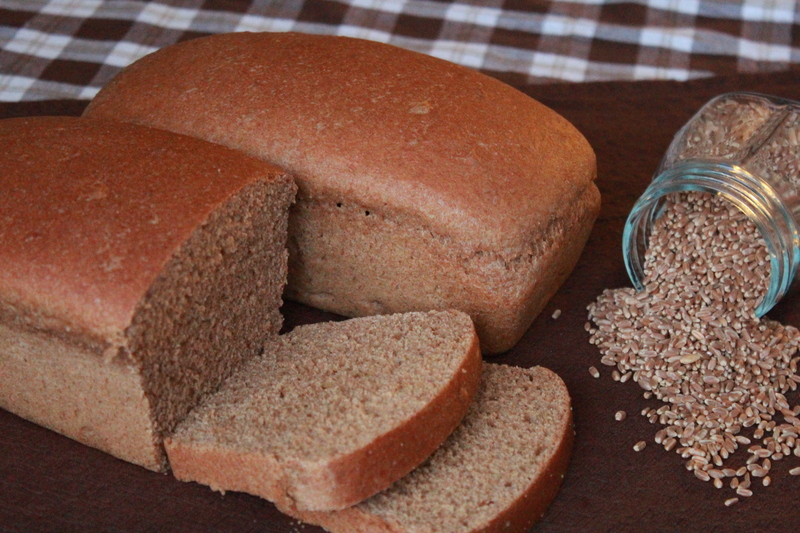 I can’t tell you how many whole wheat bread recipes I have tried through the years. There have been many that I have found and loved, but I keep coming back to this one given to me by a friend several years ago. It comes together fairly quickly for a yeast bread, requiring only one rise time, and bakes up beautifully. It has a soft, chewy texture and holds up well enough to slice up for sandwiches. The recipe makes five 4×8 inch loaves. I usually freeze three or four of the loaves, and I’m always delightfully surprised at how well the thawed loaves hold up. Generously coat five 4×8 inch pans with non-stick cooking spray. In an extra large mixing bowl combine the hot water, honey, yeast, dry milk, oil, and gluten. Mix well and allow to sit for 5 minutes. The mixture should begin to foam during this time. Add 7c of whole wheat flour and the salt to your water mixture and mix well. Continue to add remaining flour until you have a firm dough. You may not need all the flour. The dough should be sticky to the touch but firm enough to be rolled into a small ball in the palms of your hands. Knead dough for 5 minutes in a mixer, or 10 minutes by hand. Form dough into 5 equal sized loaves. Allow the dough to rise in pans until the loaves have doubled in size. Preheat oven to 400. When the bread has fully risen, bake it in the oven for 5 minutes at 400, then decrease the oven temperature to 325 and bake for an additional 20-25 minutes. Remove the loaves from the oven when the bread is nice and browned on top. Let the bread rest in the pans for 5 minutes then remove from pans and allow to cool completely on a cooling rack. Store bread in large twist tie plastic bags at room temperature or in your freezer. I love homemade cinnamon rolls, especially my mom’s cinnamon rolls. She is famous in our small town for her fabulous recipe and is known to drop a pan or two by whenever someone is experiencing loss or illness. Wouldn’t that brighten anyone up? Now that I don’t live at home, I have to make these for myself. They bring back memories of fall and my mom’s fragrant smelling house. I love how simple the dough is and how fabulous they turn out. I think the key to their tenderness is in rising time. Be sure to let them rise nice and big before baking. 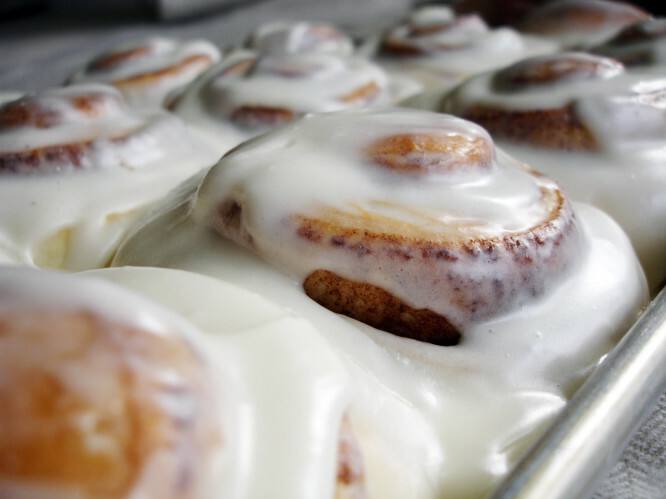 You’ll be sure to have a light gooey sweet roll. In a small bowl combine warm water, yeast, and sugar. Allow to sit for 5-10 minutes, or until foamy. In a large bowl combine milk, egg, vegetable oil, sugar, and 3 cups of flour. Add yeast mixture. Add the salt and the remaining flour. Dough should be soft, but not sticky. Knead for 5 minutes. For the filling combine the sugar and cinnamon. Roll dough out to an 11×13 inch rectangle. Dough should be about 1/4 inch to 1/2 inch thick. Spread melted butter on rolled out dough and sprinkle cinnamon sugar mixture evenly on top. Starting with the long side, roll dough up. Preheat oven to 400 degree, and grease an 11×13 inch pan. Using a piece of string or floss, cut the roll into 1 inch slices. Place rolls in baking sheet 1 inch apart. Allow to rise till double in size. Bake for 12-15 minutes, or until nicely browned on top. With a mixer, combine cream cheese, butter, vanilla, and powdered sugar. Add milk one tablespoon at a time. Spread on warm rolls.